Sydney Thomas Sherman (born in Sunningwell in 1892, registered second quarter, and baptised at Sunningwell Church on 31 July 1892). Sydney Thomas Sherman’s parents started off their married life in Woolstone, probably with Jane’s parents, as they were only aged 19 or 20, with their first baby already six months on the way. By the time of the 1881 census they were living on the Oxford Road in Abingdon, and Sydney’s father Henry was working as a fogger (a Berkshire dialect word meaning “an agricultural labourer chiefly engaged in feeding and attending to cattle”). By the end of 1883 the family had moved to Little Wittenham, and by 1890 to Cuddesdon. At the time of the 1891 census they were living in Sunningwell (at 19 Sunningwell Road), and Henry Sherman now described himself more prosaically as a “farm servant”. Sydney was born there the following year. On 12 April 1895 Sydney Thomas Sherman was admitted into Sunningwell School when he was just three years old. On 22 June that year his sister Mary was married in Sunningwell Church, followed by his brother William on 5 July 1896. By 1901 the Sherman family had moved to 38 Bayworth, Sunningwell and his father was still working as a cattleman on a farm. In 1904 his brother Ernest was married in Sunningwell Church. Sydney Thomas Sherman left school on 28 July 1905, around the time of his thirteenth birthday. By the time of the 1911 census, when he was 20, his forename was recorded simply as Thomas: he was then a “Professional Golfer’s Assistant”, and was staying at Church Lodge, Stoke Poges, the home of J. G. Sherlock. Meanwhile his parents were still living at Bayworth in 1911 with their daughter Elizabeth (21) and Elizabeth’s illegitimate daughter Queenie Elizabeth Sherman (2). 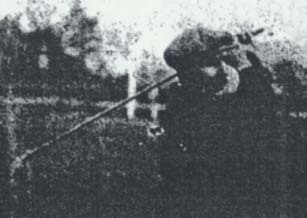 Sherman was back home by 1914, working at Frilford Heath Golf Club. The Oxford Journal Illustrated of 28 January that year reported that he had been appointed assistant to the professional of the club and was already installed in the new showroom and workshop that had just been erected close to the Frilford Club House. It added that he had been a pupil of Sherlock and lived near Sunningwell and would until March 1914 be undertaking the duties of J. Turner, who had just been appointed professional of the club. In the First World War Sydney Thomas Sherman served as a Corporal in the 4th Battalion (Reserve) of the Royal Berkshire Regiment. On 14 August 1917 he was discharged in consequence of being no longer physically fit for war service under paragraph 392 of the King's Regulations after 2 years and 285 days in the territorial force. He died at home at the age of 26 on 19 November 1918, eight days after the Armistice, and was buried at Sunningwell Church four days later. 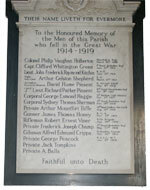 Although he is remembered on the war memorial in St Leonard’s Church at Sunningwell, he does not appear on the Commonwealth War Graves Commission’s database, and this combined with the fact that he has no war grave suggests that his death was not deemed to have been a direct result of the war. Sydney Thomas Sherman’s brother Ernest was already described as a soldier in June 1915 when two of his children were baptised, and he is on the “Those Who Served” list in Sunningwell parish hall. Jane Sherman died at the age of 68 and was buried at Sunningwell on 17 April 1924. Henry Sherman died at the age of 73 and was buried at Sunningwell on 25 August 1926. Beatrice Helen Sherman (born 1896, registered fourth quarter, and baptised at Sunningwell Church on 18 October 1896). She married Charles William Talbot at North Hinksey Church on 21 May 1916. Ernest Edward Sherman (born on 8 March 1905 and baptised at Sunningwell Church on 23 April 1905). She married Stanley Warner in 1925 in the Faringdon registration district. Isaac John Sherman (born on 15 December 1914 and baptised at Sunningwell Church on 20 June 1915). Norman L. J. Bleay (born 1919, registered Headington district fourth quarter). Queenie Elizabeth Sherman (born on 8 May 1908) was baptised at Sunningwell Church on 14 June 1908. Queenie married William Alfred Wiblin, a bus conductor, at Sunningwell Church on 1 August 1931, and their daughter Edna Joan Wiblin was born in Kennington on 2 November 1934 and baptised at Sunningwell Church on 13 January 1935. They then moved to Oxford, and their twins Gerald William Wiblin and Anne Elizabeth Wiblin were born there in 1944.. William Wiblin died in Oxford on 16 June 1973 and Queenie died in Oxford on 6 August 1991. Frederick Albert Barker Sherman (born on 13 December 1914) was baptised at Sunningwell Church on 20 June 1915, with his father's surname given as Sherman. Frederick’s address is given as Compton Villa in Sunningwell when on 4 August 1934 he married Hilda Violet Wiblin (born in Abingdon on 29 January 1903) at St Helen’s Church, Abingdon: he was just 20 years old, and she was 31 and the sister of the man who married Queenie above. They had no children: Frederick died on 25 January 1965 at Abingdon and Hilda on 31 December 1989 at Abingdon Hospital. Josephine Sherman (born in 1918 and registered in the Abingdon district in the third quarter) was baptised at Sunningwell Church on 29 October 1922, and her father’s surname and her mother’s maiden name were both registered as Sherman by the GRO. Betty Beryl Bradfield (born on 6 October 1928) was baptised at Sunningwell Church on 25 November 1928. She married Albert Bennett in the Oxford registration district in 1951.